Dundee United could have gone top of the table on Saturday. Does the loss to Queen of the South deserve to be lumped in with the rest of the big let-downs fans have had to suffer? IR: Yes, it definitely does. United are masters at building up hopes then sending them crashing down again. Let’s remember that they were facing a Queens team that had lost seven successive matches – including one against United – and were, on paper at least, extremely vulnerable. EN: It is slightly different in that in none of the other previous big game flops did they squander as many chances as on Saturday. The key point remains the same though – when United have a golden chance, they blow it. With Osman Sow struggling for fitness and Pavol Safranko struggling for confidence, are you worried about United up front? IR: They are creating chances and managers will tell you that has to be a positive thing. I’m not sure it’s that much of a positive if the ball keeps going the wrong side of the woodwork. They counted 27 against the Doonhamers and there were also several against Dunfermline in the previous game. Safranko has been the biggest culprit and surely he has to hit the back of the net soon. As for Sow, my fear is that by the time he is up and running in the team the title may have been clinched by the Staggies. EN: One up front and one off, compared to two up front, may seem like a subtle difference but it’s a difference all the same. When United are at home against teams like Queens, I’d like to see them playing 4-4-2. Would Ross County losing as well have made the United players feel better or worse? IR: That’s a tricky one. You would think there must have been a collective sigh of relief that County suffered their own shock defeat but then the players would have realised they had just blown a wonderful chance to go top. EN: It’s probably more relevant what the County players felt – pure relief. We surely must be into ‘must-win’ time for United at Dingwall? IR: Every game has to be won from now until the end of the season and they will keep the title contest alive should they do so. On the evidence of the Dunfermline victory, they are capable of taking the three points. On the evidence of the Queens defeat, they are capable of throwing away the three points. EN: United managed the game beautifully in Dingwall last time and they are well-suited to do the same again. I give them an excellent chance. I’m less confident they can get the victories they need afterwards, though. This was no weekend for Dundee fans to gloat at their city rivals. They are now bottom of the Premiership table. How significant was that loss/performance in Paisley? IR: On a rare quiet moment on the sportsdesk a month or two ago, I took a look at Dundee’s pre-split fixtures and they gave me the fear. Sadly, it has turned out as badly as I thought it would. The brutal truth for Dundee is, as things stand, they have won only four league matches out of 31. With their total of 18 points they have six fewer than United had after the same number of games in their relegation season of 2015-16. Even Ross County, who finished bottom last season, had 24 at that stage. Indeed, the Dark Blues are fortunate not to be cut adrift. 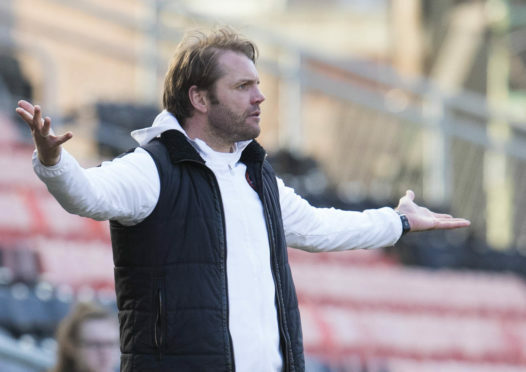 EN: I would have taken a draw going into the game but to make such a good start and lose was as bad as it could have got – for Dundee’s confidence and, on the flip-side of the coin, St Mirren’s. The basic goals conceded and the lack of control in midfield were the biggest issues. Football logic would suggest that won’t be sorted at this late stage of the season. Jim McIntyre questioned his players’ reaction to going behind. That surely has to be a huge concern for a team fighting for their lives? IR: Having chatted to some people who were at the game, Eric included, that seems to be the major worry. A lack of response to going behind in a massive match when there was so much at stake will have alarm bells ringing at Dens. EN: This was the first occasion in a while that I felt previous disappointments (such as the injury time Celtic goal) caught up with them. This is no time for accepting your fate. 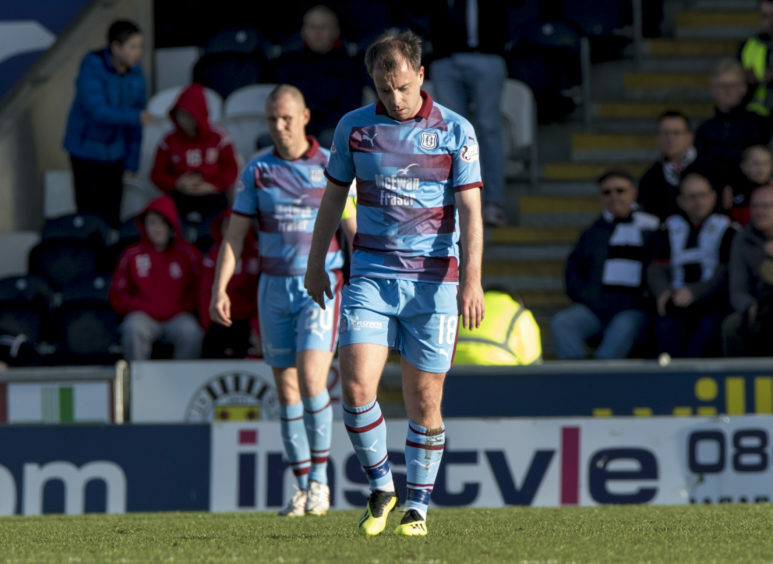 Paul McGowan could return for the St Johnstone game. McIntyre had some experienced players on the bench for the St Mirren game. Did you expect to see the return of Paul McGowan, Kenny Miller and Darren O’Dea at McDiarmid Park for the St Johnstone game? IR: I have always been a fan of McGowan and I think he would give everything in the next must-win against St Johnstone. The same could be said of the others. I also think McIntyre will feel he needs to freshen things up after that display against the Buddies. EN: McGowan for Nelson and Miller for Craig Curran would be two changes I’d make. I’d also be tempted to bring in Jesse Curran. Dundee fans will be hoping Andrew Nelson is fresh enough to go again after playing the full game on his comeback at the weekend. Is this a good or bad time to be playing St Johnstone? 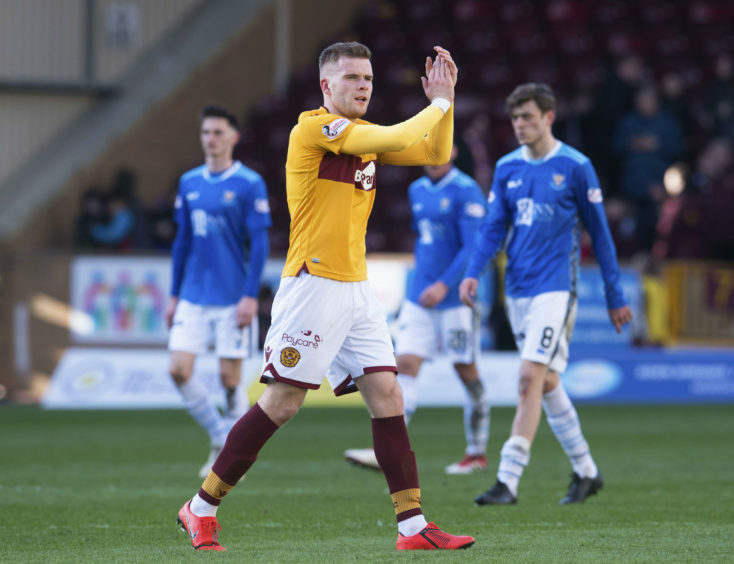 IR: It is a good time if you think Saints boss Tommy Wright won’t get a reaction out of his own players following their heavy loss at Motherwell. However, I think that would be an optimistic take on it from a Dundee perspective. I believe Saints will be relishing this fixture. EN: On form, Saints are exactly the team you would want to play just now. If anything, Tommy Wright was harder on his players post-Motherwell than McIntyre was with Dundee post-St Mirren. So, Ian’s right, there will be a reaction. Saints are a side lacking confidence, though. We’re getting close to must-win territory for Dundee now. It’s maybe not the easiest question to answer in a couple of sentences but what has gone wrong for Saints? IR: Mention has been made at McDiarmid of how disjointed their season has been thanks to international breaks, cancelled matches etc. It also left them with a sequence of three games in 12 days against Celtic, all of which were lost. That looks to have derailed what had been a promising campaign. EN: The Celtic games and January signings failing to make an impact would be the two key reasons I’d point to. St Johnstone lost 3-0 to Motherwell. Who takes the next penalty for them? IR: What about giving the gaffer a go? EN: Every centre-forward should want to be on penalties to boost their goal stats. It’s a one v one with the keeper after all and that’s a striker’s trade. So Chris Kane. It’s all gone quiet at Hampden since reports emerged that Alex McLeish has managed his last game for Scotland. Surely this has to be sorted out quickly and if you think McLeish should be sacked, who would you choose to replace him? IR: I would go for Pep Guardiola but if he feels the job is too big for him then Steve Clarke would be fine. EN: This should have been sorted already. Every manager deserves a clean break when their time is up. And, yes, Clarke will do for me too.